Do You Have One in Your Chart, or in Your Relationship Chart? In the drawing to the left, I have shown you my own natal chart (courtesy of Astro.com, which can compute yours and your partner's in a matter of seconds), so I can show you what a "yod" is. In my chart it's pretty prominent. 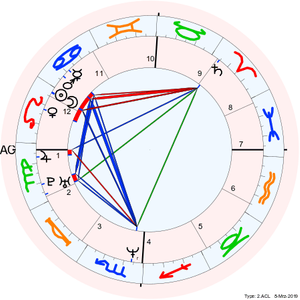 In understanding what was going on with my relationships, I discovered multiple yods in my chart, his chart, and every relationship chart I constructed for us, and understanding these yods became key to understanding what was happening, why, and what sort of personal growth needed to happen to change and improve the problems. The classic astrological yod is known to astrologers as "The Finger of God," and I'll explain in a minute why most practicing astrologers think so. It is defined by the two bottom planets, in this case Uranus and Neptune, being sixty degrees apart, and each one being separated from the apex planet by an angle of 150 degrees. Other yod configurations can exist with different angles, but this is the classic one and the one most astrologers mean when they tell you, "You have a yod in your chart." The main thing that makes a yod a yod is the long, skinny shape of the triangle. A broad-based triangle with all the sides and angles the same is a "Grand Trine," which isn't the same thing at all! to “A yod is a test your soul has set for itself in this lifetime, to see how much you know about a topic. You may never know exactly what the topic is. But you’ve studied it in prior lifetimes and done pretty well, so now you are in spiritual graduate school in this lifetime and this is sort of an exam you’ve designed for yourself to see how far you’ve come. If you pass the test, you can accrue substantial benefits.” This last quote is from my astrologer, Alice Portman (private reading). Astrologer Manda Selva writes that, “When you have something in your life, whether it is a relationship or a business that kind of works—sometimes good and sometimes not so good—but cannot be easily steered in any one direction, then it is probably propelled by a quincunx (what astrologers call a 150 degree angle) energy. A Yod pattern is a bit more connected than a quincunx as it has a sextile aspect as part of the pattern, and which can facilitate communication and bring in opportunities. The Yod in Astrology can create events, incidents, relationships etc, that occur in a person’s life not out of their choice but in a karmic manner. These circumstances usually come as an opportunity and eventually turn out to be a blessing or a curse. Bob Marks writes that “the T-Cross sets out a problem and pushes you to a find a solution in the ‘empty leg’ of the cross. The Yod just pushes you and the solutions are seldom simple. It’s not nicknamed ‘The Finger of God’ for nothing." However, in my perusal of several yods in about five charts I’ve looked at, I’ve noticed one thing about yods and possible solutions to them that I haven’t seen written about. Obviously, this is a pretty limited sample, so anyone reading more charts with yods in them can tell me if I’m full of … or not. Below, what I know about yods with my observation at the end. 2.) (I have seen a couple of astrologers write this one.) If another planet sits in between the two sextile planets, this planet makes the yod a “boomerang yod”, and the “boomerang” planet describes what to do to solve the dilemma described by the yod. (What that would look like, is if a fourth planet sat right smack dab in between Uranus and Neptune, up there. The fascinating thing is, if you superimpose my affair partner's chart over mine, HE has a combination of two planets that do this! And, he has a yod, turned in the opposite direction from mine, and MY Saturn makes HIS yod a boomerang yod! Is this important?? YOU BETCHA! As we get into the meanings of the planets and the lines up there, or the "aspects" between them, you'll see how. So, in the astrological yod, we have a complete description of an important problem or issue in a person’s life (especially if there’s a boomerang, or if another person’s chart contains a planet that makes a boomerang with the yod.) We can tell what it is, how it got started, when in the life the issues are going to become important to the person, and sometimes what to do to resolve the issues. As I said, I’m a student so don’t have a pile of examples. But I’m going to post the ones I have. Obviously, some of the examples will be from my chart and my affair partner's. To break this up into shorter bites that are a little easier to "digest," I will be putting the examples up in separate articles after this one. Example One: My Own Yod, 1-4.